Miss Universe Thailand 2017 second runner-up Fahsai Paweensuda Drouin has been appointed to represent Thailand at the 17th edition of Miss Earth Pageant which is set to be held on November 4, 2017 at the Mall of Asia Arena in Pasay City, Philippines. Jennifer Paweensuda Saetan-Drouin, or ‘Fahsai' is a Kinesiology ( the scientific study of human or non-human body movement) graduate from the University of Calgary in Canada. 5'10" tall stunner is a DJ at Bangkok's FM99 Active Radio. 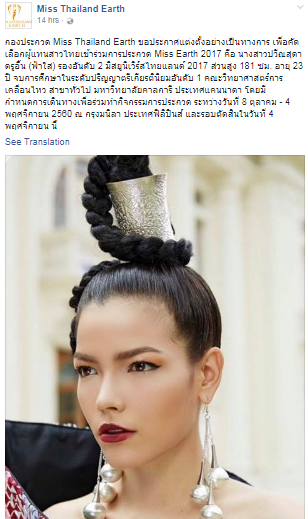 Could Paweensuda be the first Thai to win Miss Earth 2017?